The Pomodoro Technique was developed by Francesco Cirillo in the late 1980’s. The technique is to use a timer to break down work/tasks into intervals. Each interval lasts 25 minutes which is then followed by a small 5 minute break. The interval is known as a Pomodoro which is Italian for tomato and represents segments. Once you have completed 4 Pomodoro’s you then take a longer break of around 15-30 minutes before starting again. 3) Work on the task until the timer goes off. 4) Put a check mark on a piece of paper. 5) Reset the timer and repeat 3 more times. 6) After the 4th Pomodoro take a longer break. Planning > Tracking > Recording > Visualizing. I have been using this method for a couple of weeks now and it seems to be highly effective at getting things done. For tasks which require more lengthy processing time or at those times when motivation and energy is high I also use another method known as Time-boxing. This is when you allocate a fixed time period called a time-box to a planned activity. An example of this was when I was unpacking my bedroom wardrobe contents this week. I allocated myself 1.5 hours to get it all done. 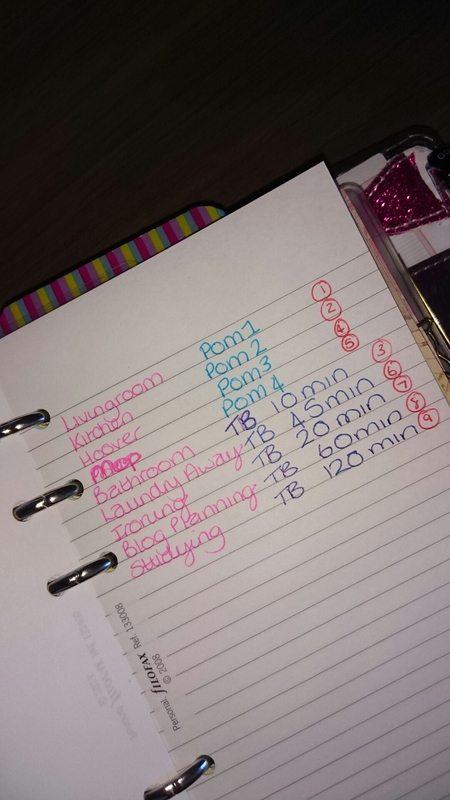 If you are like me and have some form of planner with you at all times it is handy to write down your tasks and think about how long it will take to complete them. I always add an extra 5-10 mins just in case. I then work through the list starting with either the longest or most dreaded of tasks (for me that is sorting out all the laundry on Sunday’s). I separate them into Pomodoro’s and Time-Boxes. Do any of you use a time management technique? If so which? I love the idea, but I’d do cascading lower times after each session. So 45 minutes, then 35 minutes, then 25 minutes, then 15 minutes. That way I earn a reward (less work time) when I am done.